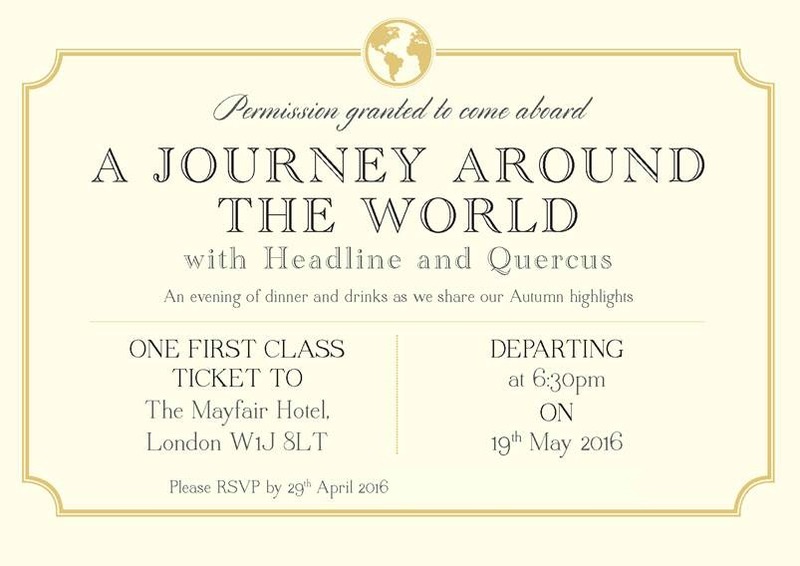 The prize for THE best book invite this year goes to Headline and Quercus publishers. I can't tell you how thrilled I was to be invited to Headline and Quercus' Autumn Highlights event. This was an evening to present to us their key books that they are publishing in the latter half of this year and I was literally in book heaven! 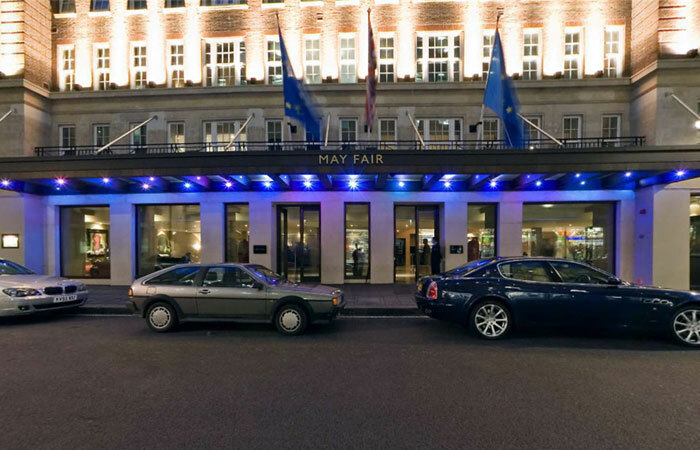 This incredible evening started at The Mayfair hotel in London, which I have never had the pleasure of setting foot in before and yes it was amazing. We were first greeted with a little drinks reception where we able to mingle with publishers, journalists and authors. 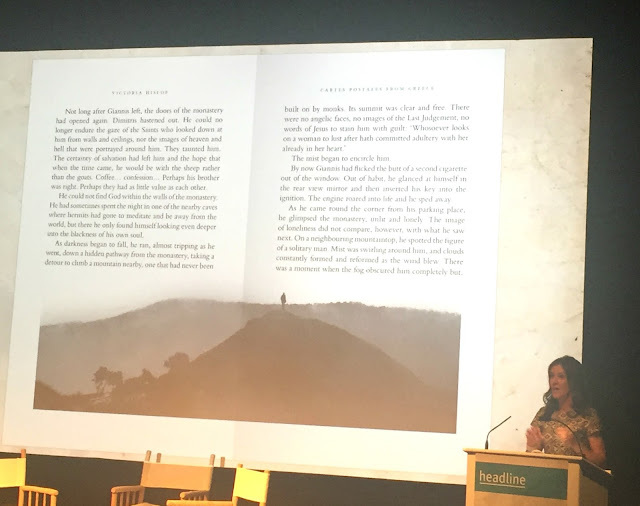 Soon it was time for the most exciting part of the evening, the presentation and the Journey around the world for all their books. 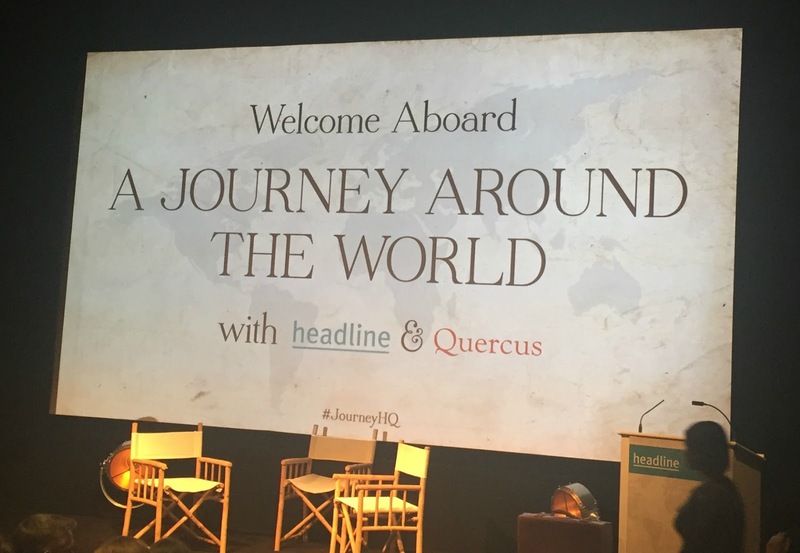 Mari Evans, Managing Director of Headline and Jon Butler, Managing Director of Quercus began our #JourneyHQ journey with a few little things as to what was in store for us. We would be taken through all genres of fiction and non-fiction and I have selected a few of the books that have caught my interest! 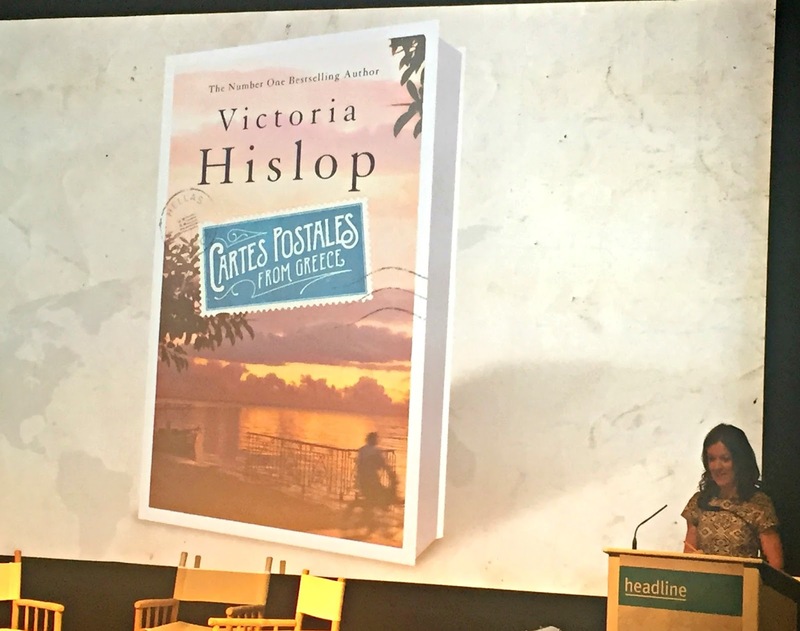 First up was the amazing author Victoria Hislop, author of The Sunrise, The Island and many more. Her latest offering is Carte Postales from Greece. Victoria read a little snippet from her new book and I was utterly enchanted. Not only inspired by her love of Greece, this book has a little something extra that I think fans and new readers are going to love. Victoria went round Greece with a photographer, taking some of the most wonderful pictures, with the one pictured it was completely by chance that a lone man was standing on top of that hill and was of course an unmissable photo opportunity. Victoria said that it is "Adult fiction in full colour" and stated that why is it that you get to adulthood and that's it now, you can only read in print- no pictures. She had a very fair point! Publishing on 22nd September, I shall be looking out for this one. The following books were presented by other awesome publishing people and these were a few that took my fancy. Where to begin?! 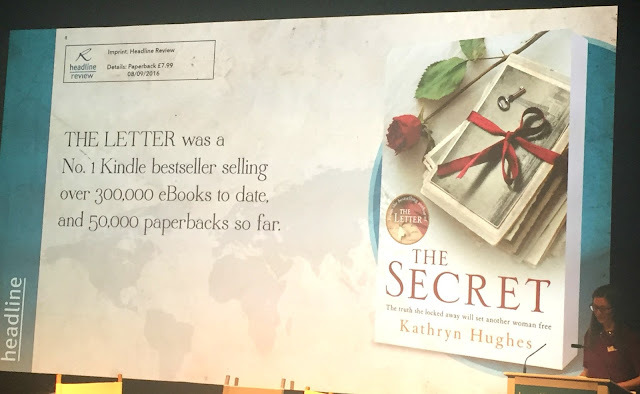 Embarrassingly I am yet to read The Letter, which was a number one kindle bestseller and as the slide says has currently sold over 300,000 ebooks!! A lot of readers begged for a follow up and as it is always best to listen to your readers, The Secret is due to be published in September and I'm sure fans cannot wait, I will make sure I read The Letter before then. Next up were three thrillers, Undertow, Blood Wedding and Before I Let You In. I am so into thrillers at the moment, which if you has asked me about my view on 5 years ago, I would have surprisingly told you that it wasn't my thing! How things have changed. Undertow by Elizabeth Heathcote immediately caught my eye with it's eery looking cover and the fact that it is for fans of Disclaimer and Apple Tree Yard had me pretty much sold. 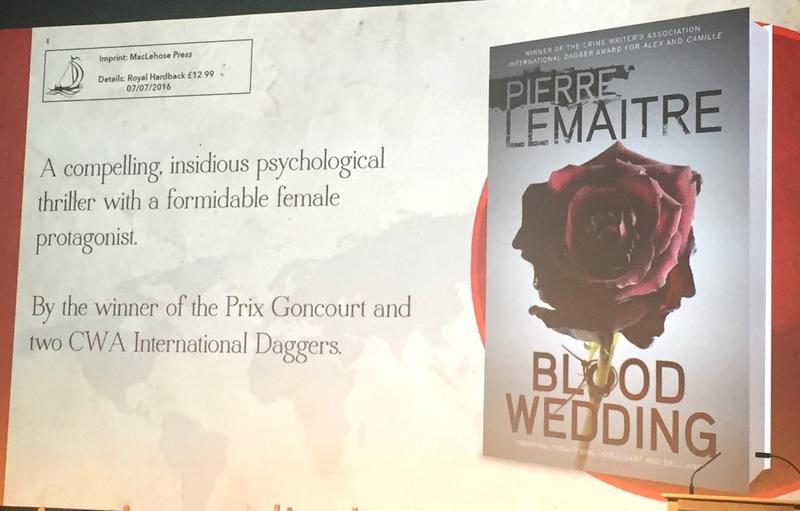 Blood Wedding definitely doesn't sound like a story for the faint hearted; described as a pure thriller, this is a book about revenge that is terrifying and highly vicious in it's violence. Stephen King loved it, so as Quercus said, if it's good enough for Stephen King, it's good enough for you! Now another book that I should have read but haven't (sorry!) 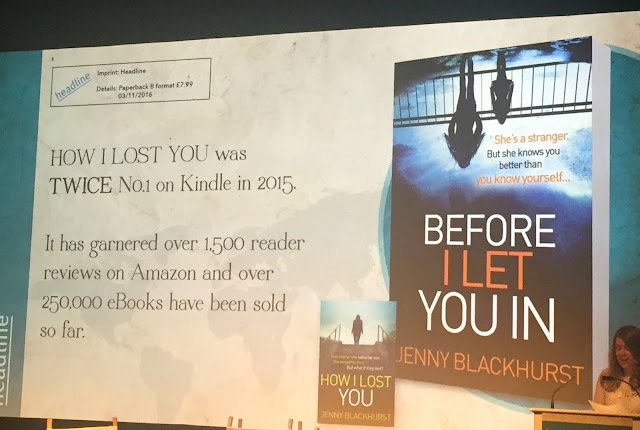 was Jenny Blackhurst's How I Lost You, which was the kindle number one bestseller twice and has had over 1500 reviews on amazon. Now Jenny has her second book coming out Before I Let You In and wow I just 100% have to read this one! It's about a stranger knowing you better than you know yourself and it's out in November. 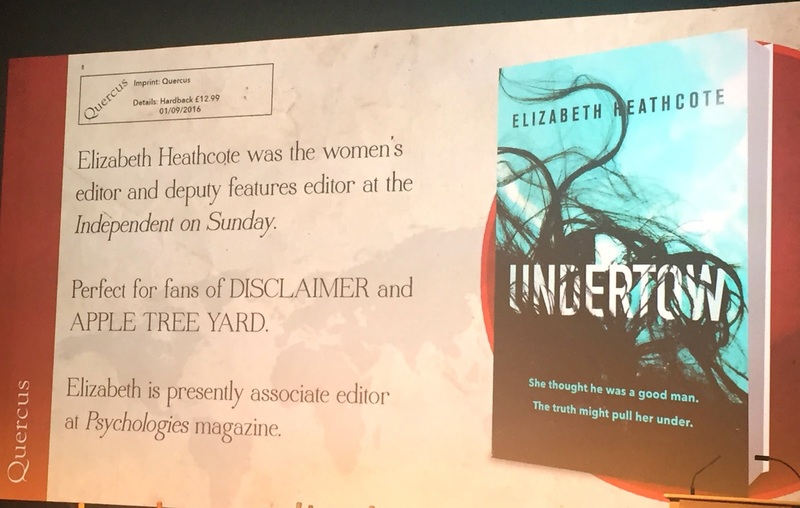 In-between presentations we had some brilliant book trailers and other book highlights, the one that stood out the most for me was The Girl Before. The trailer for this brought me out in goosebumps. If that won't make you want to read this book then I don't know what will. The Girl Before was bought based on reading 50 pages. I am SO excited for this 2017 thriller! The awesome presentation continued and we had Stef Penny, author of The Tenderness of Wolves, which won the 2006 Costa book of the year award, come to the stage to discuss her new book Under a Pole Star. (A tenth anniversary edition of The Tenderness of Wolves is being released this year). This cover took my breath away with it's stunning beauty. Set in Alaska, Stef was asked why she set her novels there, a fairly uninhabitable place and if my memory serves me right she said that she would never want to go there so she likes to write about it, which seemed fair enough in my opinion. Us readers don't have to go there, but we can read about it. 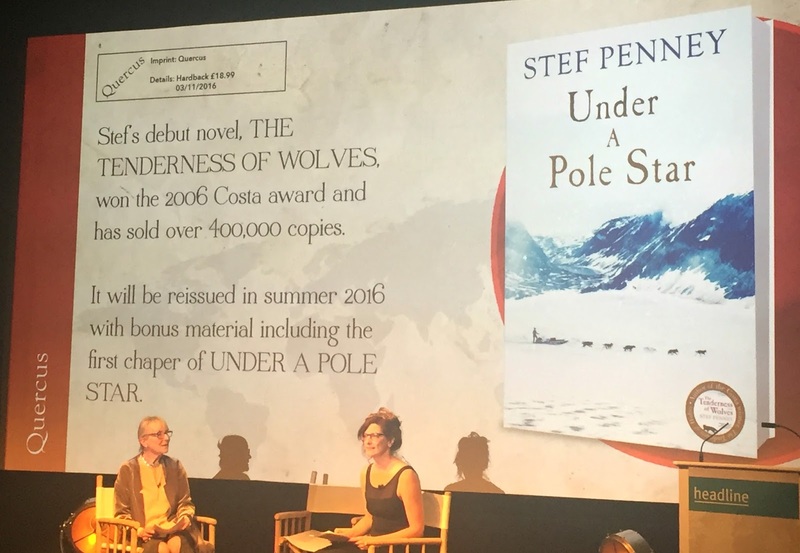 Under a Pole Star is released in November. Other fiction books that caught my eye were The Hidden People by Alison Littlewood and obviously (because I have been tweeting about it loads) To the Bright Edge of the World by Eowyn Ivy. 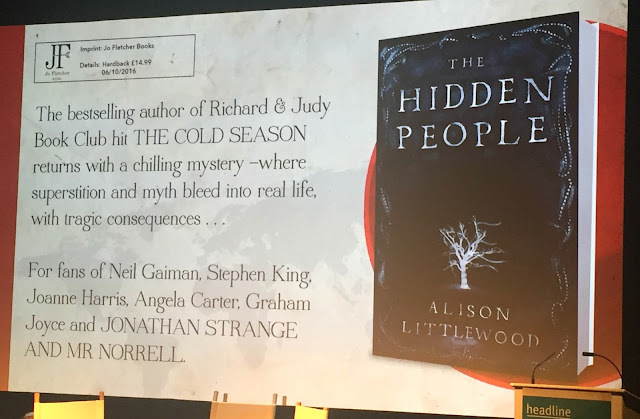 The Hidden People got a little ooh out of me as the cover seemed eery and intriguing and Alison Littlewood is also the bestselling author of The Cold Season as part of the Richard and Judy book club. This is where myth and superstition bleed into real life and comes out at the perfect month of October. 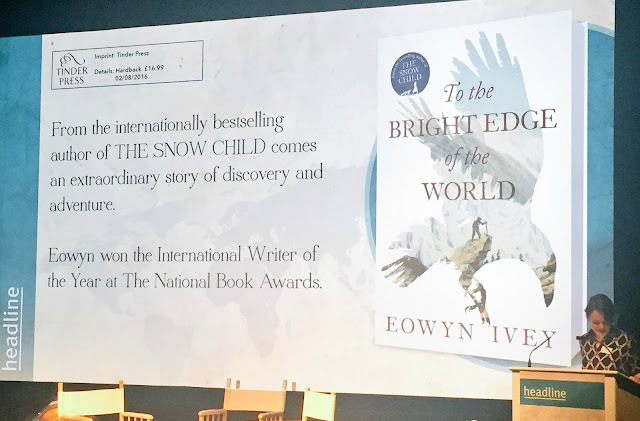 Now if you loved The Snow Child like me, then you will be highly anticipated Eowyn's next read To the Bright Edge of the World. Set in Alaska, which Eowyn compeltely sold to me in The Snow Child comes breathtaking story of discovery set at the end of the nineteenth century. You must watch the gorgeous trailer below. On to a little bit of non-fiction now and one book that brought a smile to my face was the Famous Five book's for grown-ups, genius and very funny. 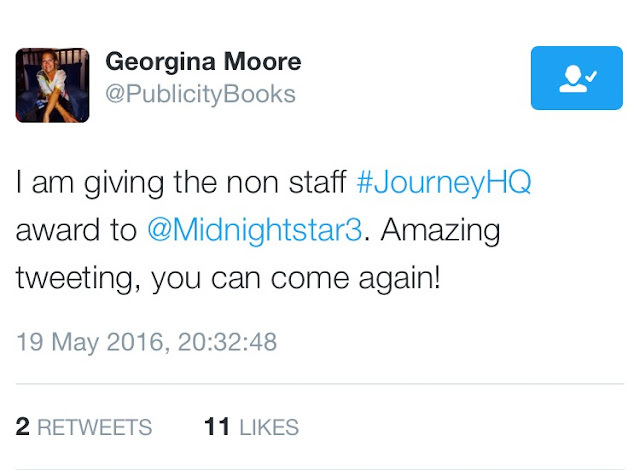 I think fans of The Famous Five books are going to be very excited for these. I have only read one of The Famous Five books, but now I have an excuse to read more about them in these hilarious books where "they confront challenges of living without booze for a month, finding themselves on a puzzling "strategy away day", attempt to find a good gluten-free cream tea, and, "most perilous of all", prepare for parenthood" (The Bookseller). Five Go Gluten Free is out in November. 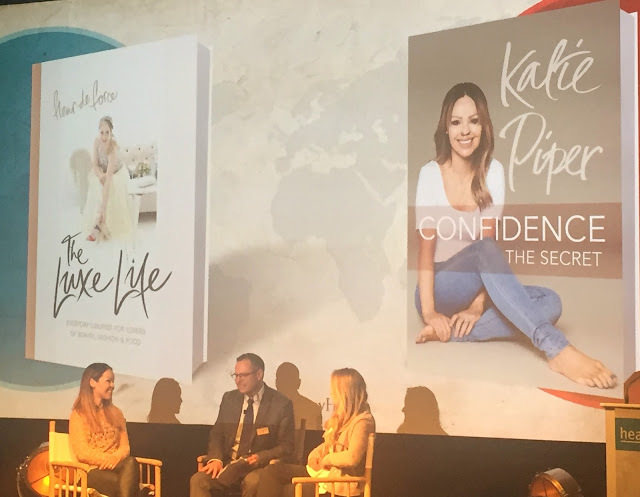 One of my most favourite parts of the night though was a talk with the incredible Katie Piper and Fleur de Force. Both were talking about confidence as that is the theme their books center around. Katie was saying how it's easy for people to think that you are more confident than you are and that even when you fail at something, failure is just practice for success. I think this is so true, as it's so easy to just give up, but mistakes are normal and it's ok to make them and learn from them Fleur was also saying that she never photoshops are pictures of her or her life as she wants to be a relatable as possible to her followers, which is how I think every vlogger/blogger should come across. It was an honour to listen to these two ladies and it made my evening even more special. The Luxe Life by Fleur de Force is out in July and Confidence: The Secret is available in December. After the presentation we got to have an amazing sit down dinner and listen to a few more of the authors that were there give a little speech. Upon returning home, I was greeted by an absolutely fantastic package, which was to say thank you for attending and contained the following. I was hugely excited to receive a proof of The Girl Before and other wonderful exclusive goodies. I was also super thrilled to get a mention of Publicity Queen that is Georgina Moore of Headline for being the best nonstaff tweeter for the event. I had such a fantastic evening and was thrilled to be able to attend. Another huge thanks to the team at Headline and Quercus. It sounds like such a brilliant event, I'm glad you had a great time! 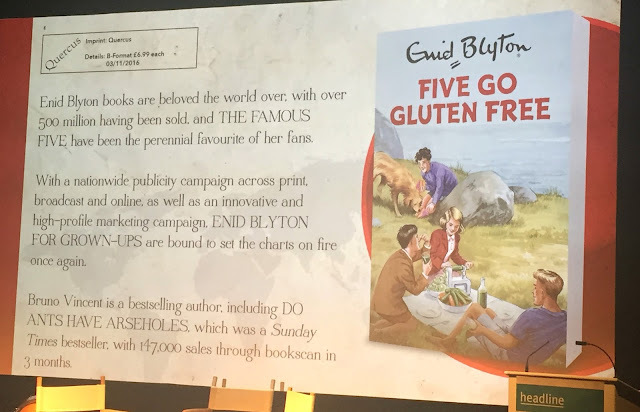 I'm most excited for the Enid Blyton for Grown-Up series and I cannot believe you've only ead one Famous Five book D: D: D: D: They're such quick reads that you HAVE to rectifyy this!